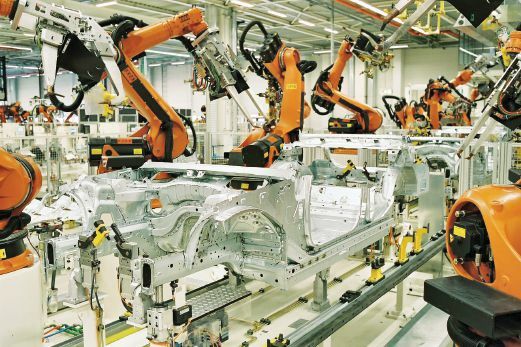 An automotive plant using industrial robotics technology. We cannot continue to rely on labour-intensive industries if we are serious about moving up to achieve high-income nation status. Sometimes, thoughts can emerge out of nowhere. I was immersing myself in a newly acquired hobby when I figured out linkages between some seemingly unrelated things, which were an unmanned aerial vehicle (UAV) or simply called a drone, Malaysia’s goal of becoming a developed and high-income nation by 2020, and the perennial influx of migrant workers into the country. The new hobby I recently got myself into was taking pictures and videos from a new perspective, from above. The advancement of consumer level UAVs has made it possible for enthusiasts like me to indulge in the hobby. Such drones are actually nothing more than a four-propeller helicopter (a quad-copter) with a powerful camera attached. The control of the drone’s flight, as well as that of the camera, is transmitted real time by WiFi to a powerful handheld transmitter no larger than a notebook and also to a smartphone or tablet, where the operator sees what the camera is seeing. The flight of the drone itself is governed by global positioning satellites and an onboard computer that enables the craft to pinpoint and remember its exact location at all times. It is possible to pre-plan its flight through commands made via the smartphone, thus, freeing the operator to focus on manipulating the camera during flight. As a proficient pilot of the extremely difficult to fly radio-controlled helicopters previously, the added technological features provided by modern consumer drones make them a breeze for me to operate. The craft I now own costs a bit on the high side, probably because of the technology that went into its development. I had to insure the drone, always remembering the saying that what goes up will come down, inevitably. It was made by a company based in California. Or, at least that was where its idea was conceived. Upon tinkering with it, after flying the drone several times, I began to notice the “Made in China” letterings on some parts of the craft. Apparently, like many other things on our planet now, the technology belongs to the Americans but the manufacturing is done somewhere else, almost always where labour is cheaper. The discovery brought my mind back to a couple of decades ago. Remember that “K-economy” initiative, or that “Cluster Development” programme under our Industrial Master Plan? Let me refresh you. The K-economy or knowledge-­based economy initiative was planned to be the next chapter after Malaysia’s move into the industrial arena. Quite simply, it was an initiative to diversify our earnings from just being concentrated in the natural resources and manufacturing sectors to progressively include that derived from the technological knowledge sector. On paper, at least, we were supposed to phase out labour-intensive industries to be replaced by activities in creating indigenous technologies. That was among the reasons why the government developed the Multimedia Super Corridor and Cyberjaya. Both were, among others, to act as incubators of homegrown technology. The Cluster Development programme under the Industrial Master Plan, meanwhile, was one where we would seek product development using indigenous technology in clusters, each comprising research and development facilities, the financial sector for financing and the commercial sector for the manufacture and export of such products. It, too, should broaden Malaysia’s economic base and, increase wages, and consequently lessen our dependence on unskilled foreign workers. The initiative would create a vibrant research and development sector, which would have hastened Malaysia’s entry into the K-economy environment itself. Unfortunately, we are not anywhere near realising the goals of both the K-economy and the Cluster Development Programme, at least in so far as what we see around us now would indicate. Apart from still relying heavily on the construction, oil and gas, commodities and tourism sectors, we are still largely an assembler of things. We assemble a wide variety of electrical items, for instance, but own only a minute portion of the technology that goes behind the products. Add this to reluctance of the local workforce to work in the assembly lines, most blaming the low wages, we have had to continue relying on cheaper migrant labour and grapple with issues related to their influx. The only way forward, if at all we want to achieve a developed and high-income nation status, would be to change the structure of our economy. We cannot continue to rely on labour-intensive industries as not only are our neighbours catching up, some have in fact moved rapidly into high-technology sectors, which are less dependent on unskilled labour. We may start by revisiting the K-economy initiative and the Cluster Development programme.